This paper presents a framework that provides domain specific classes for accessing and updating topic map data structures in a distributed environment. While work on Topic Map Web Services (TMWS)  have begun to provide developers with SOA type patterns for interacting with Topic Map data there is still a need for developers to be able to work with higher level views of the topic map data. TMAPI  has been the de-facto mechanism by which developers have accessed and updated topic map data. 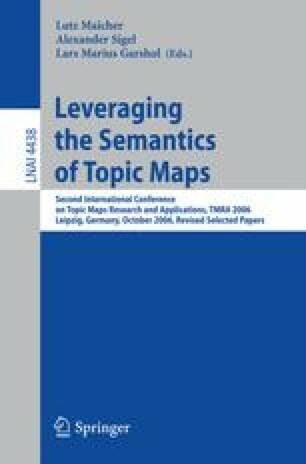 Topic Map Objects marries the advances in TMWS development with advances in modern language features of Java and C#. The result is a framework that allows developers to work with classes and objects that are relevant to the problem domain at hand. The expected contribution from this development is that developers can more easily use and work with topic maps with only a limited amount of knowledge about the full Topic Map Data Model (TMDM). In addition, developers will spend less time writing specific access code in order to construct domain specific applications.